Holds three guitars securely. Stable when less than three guitars are stored. 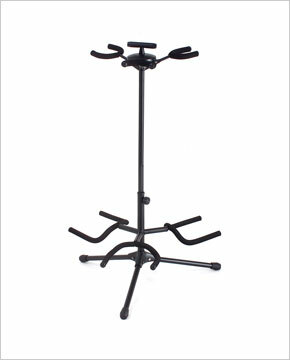 Welded extension tubes for cradles and all removable components are keyed for easy and secure assembly. Die cast hub for long life. Convenient handle for moving included on top. Satin rubber cushions for protection. Folds for transport and storage. Durable black powder coated finish.